I've just taken delivery of some fantastic wavy soap cutters. 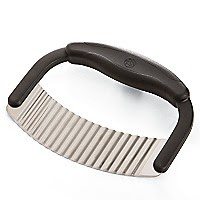 These sturdy stainless steel-blade soap cutters are the perfect way to give your soaps a decorative edge. With an easy-to-grip plastic handle and a cutting range of 140mm x 115mm, this cutter will neatly cut soap loaves into wavy-sided bars. Each cutter comes with a plastic blade guard to protect you and the blade when the cutter is not in use. Supplies are limited, and at just £8.99, they're bound to sell fast. You'll find them in our Special Offers section. I want one Elizabeth, save one for me please. Crinkle cutters are the bomb! Makes cutting soap so much easier. Hi Lori -- I used to use a crinkle cutter for cutting soaps that didn't lather quite so well (high olive). All that extra surface area really helps with lather. I never knew that about the crinkle surface helping with lather...thanks for the tip! I think Crinkle cutters are very useful. They provide great help while cutting soaps.